Tawhirimatea, blow winds blow, Ra, warm us up with your sunshine glow. Papatuanuku, we plant seeds in you. Ua, rain, helps new life come through . . . 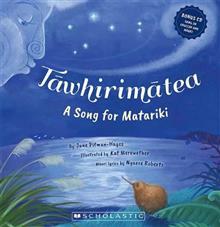 Sing along to this catchy Matariki song celebrating Earth, sky, seasons and whanau. It's our very own Aotearoa, from fores... read full description below. Ra, warm us up with your sunshine glow. Papatuanuku, we plant seeds in you. Ua, rain, helps new life come through . . .
Aotearoa, from forest to seashore, dawn light to starry night.